This post originally appeared on June 1, 2005. I was trying to explain to a friend the other day how Elvis' life and mine got intertwined many years ago when I tried to write a novel. She said I could still write it. That made me think about the book and why I never finished it. But this post explains better than I can verbally articulate (again) why that probably won't happen. Then there was the antique Camel back trunk I was going to restore (I bought it at an auction in 1978...it was pretty much falling apart, rusty and ready for the dump). I spray painted it black and gold, tried replacing the rusted metal parts with copper and was in the process of relining the trunk with cedar. That unfinished process began in 1989. The trunk sold at a garage sale for $5. When I was 16 years old, I got a job at the Boise Public Library shelving books. I liked to read and I figured that would be a cushy job and keep me from busing tables. Let me tell you that it basically sucked (though I do know the Dewey Decimal System pretty well to this day... the early 300 section used to be pretty racy). But as I wandered through the stacks randomly shoving books on shelves when the librarians weren't watching, I vowed that someday, some poor pimply teenager would be shelving a book that I wrote. I started writing a novel in 1990. 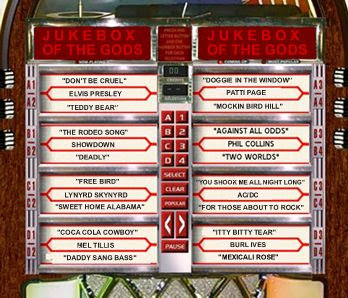 It's working title was Jukebox of the Gods. I was going to be the next Tom Robbins. I wrote about 150 pages. The plot was pretty simple. It involved the "many-worlds" interpretation of Quantum Physics (including Schrodinger's cat), Elvis (yes, Lights in the Wake...Elvis and Quantum Physics in the same sentence again), an exotic dancer, a conspiracy theory, twins and a jukebox. In my never completed novel, the main character (a mild-mannered, non-assertive and gentle man recently jilted by his girlfriend) goes to a local dive tavern to lubricate his broken heart. The tavern contains a jukebox with an eclectic collection of songs including the Rodeo Song, How Much for that Doggie in the Window, Freebird, lots of AC/DC and most importantly, Don't Be Cruel by...you guessed it...Elvis. Our jilted friend pops a quarter in the jukebox, and punches in the number for Don't Be Cruel. At the exact same nanosecond, a carbon copy of our main character punches the exact same number for the exact same song in a parallel universe. This is a cosmic no-no. It is never supposed to happen. There is a hiccup in the quantum scheme of things and a tear is created in the seam between the two universes. The main character's twin is sucked into our world (remember that Elvis was a twin and his brother died at birth). But, although they look alike, they are mirror opposites in personality. Now since it was an Elvis song that was the catalyst for this anomaly, there also erupts this frenzy of Elvis sightings in this world. But Elvis is appearing in all of his many parallel universe forms, including as a laser printer, a St. Bernard and an ATM machine. This triggers activation of secret organization similar to the Freemasons that have just been waiting for signs of the King's second coming. That's it in a nutshell. I like the plot, but it was just all that filling in the gaps that got exhausting. When I started the book, I was writing full time in my day job. There is nothing like writing all day and then coming home and sitting in front of the computer to pound out a novel. The 150 or so pages I managed to write are somewhere on a Mac disk. I now work on a PC. Some day I'm going to try an recover those pages. I quite liked the second verse. I could even hear a twangy country-style instrument twanging in the gaps. Breaks? Whatever.